Those that know me well know that I first felt called to be a missionary as a young child. My 1st/2nd grade Sunday School teacher would tell us stories of missionaries, and I was able to identify with one missionary in particular: Amy Carmichael. Amy looked different than her siblings; while they were all blond hair and blue eyed, Amy had brown hair and brown eyes. Amy was teased for being different, and would pray to God for Him to change her hair and eye color. When Amy grew up she became a missionary to India, and because she had dark eyes and hair, she was able to blend in with that culture and wasn’t considered a foreigner at first glance. Amy went on to open an orphanage in India, and stayed there for 55 years. I have always admired her, and her story. I have 2 sisters- they are both blond hair and have blue/green eyes. I am the only one with dark hair and dark eyes. After hearing Amy’s story I often wondered to myself if God made me different because he had a plan for me as well. He did; he does. This year marks 10 years since I first went abroad to serve God as a missionary- and I have lived on the mission field for 7 years. Isaac and I recently visited several churches, both in Costa Rica and in the US, to speak about missions, share our journey, and tell our story. 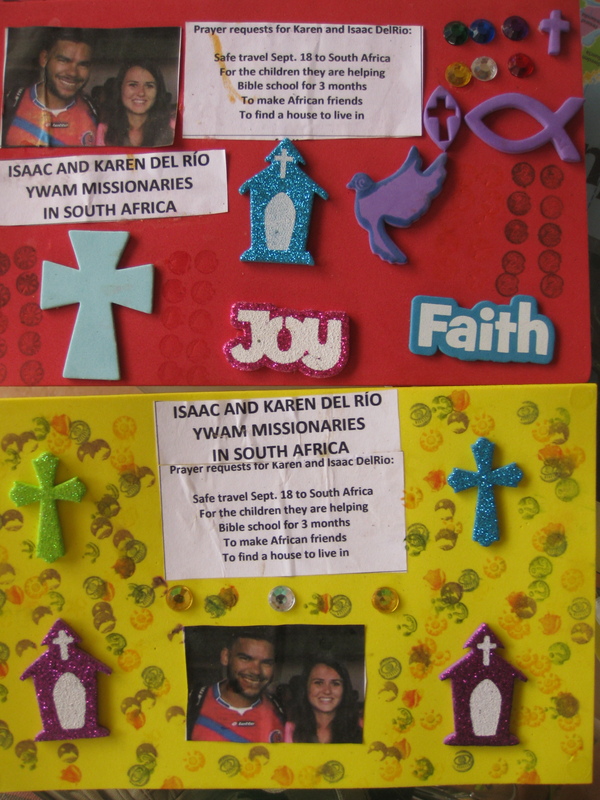 I was overwhelmed when I saw the craft the kids had made. They are praying for us. They are retelling our stories. It is humbling. It is honoring. It makes me remember when I was young and looked up to the missionary I had only heard stories of, and imagine how God is using our stories to move the hearts of kids in the next generation to go & tell the world about Him.